This is another cheep modeling project on how to to turn another Tyco car into a decent looking Southern Pacific G-50-25 type gondola. The prototype cars, a total of 400 were assembled at the Sacramento Shops during the years of 1951-52 and numbered 160650 – 161049. By 1956 the cars were renumbered between 300024 – 300423, twenty six of these gondolas saw service into the 1980s. What I’m trying to do is make a close representation of this type of gondola car without making this project a life’s work. Starting with a Tyco car is not intended to be billed for contest modeling, but to blend in with the rest of the cars on my layout. As you may well know how a modeling project can wind up back in storage for years because of the lack of detail part not being an exact match. So far, with the equipment running on my layout I have not had a vistor point out to me that one of my Tyco cars is missing some little prototype detail. First is to remove the plastic grab irons and end ladders from the cars plastic body with an Xacto knife. The stirrup steps were also cut off to be flush with the underbody and new holes drilled for metal ones. The metal frame is held on to the plastic car body by two small rivets countersunk into the frame at each end of the car as shown. 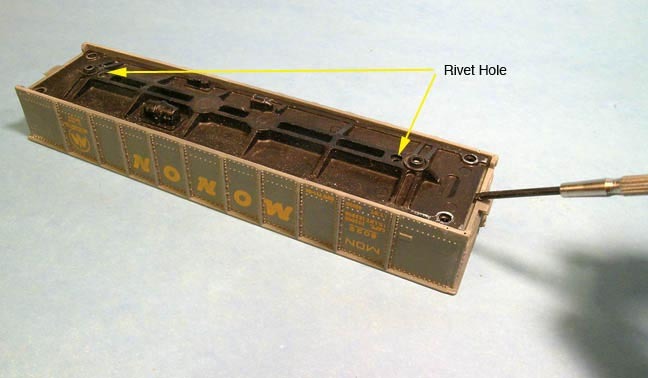 Use a small screwdriver to pry up the frame and the rivet will pull out easily. 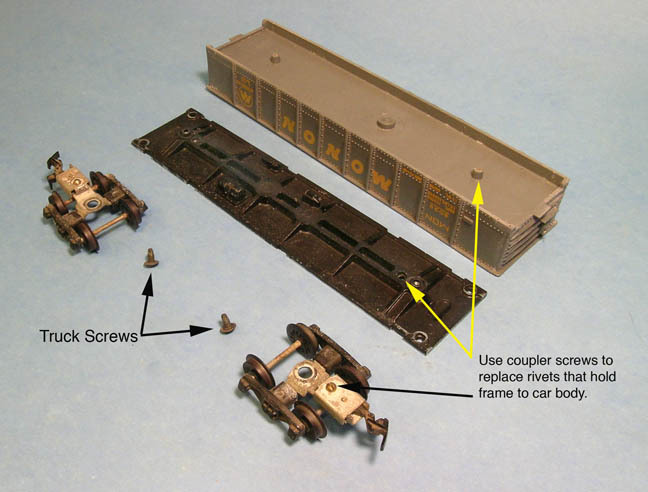 After the trucks and frame are removed, use the small brass screw that holds the coupler to the Tyco truck to replace the rivets. It will screw it in to the plastic body hole without rethreading the hole. Also save the Truck Screws (see picture) that will replace the Tyco trucks if you wish to use Kadee sprung trucks, the screw fits into the Kadee bolster to the metal under frame. 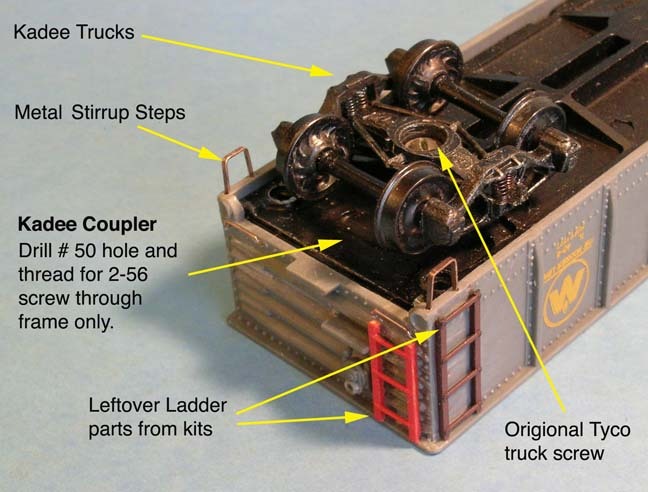 If you are using an Athearn type plastic truck, the bolster hole will need enlarging just a little by using a round file so to fit over the frame shoulder hole. I used ladders left over parts from several kits, although they’re not exact, they do closely match the prototype car ladders. You can order this picture from Rich Burg: Cinderandeight@aol.com Ask for a PDF of his entire Freight Car Photograph Collection to order from, also includes other railroads. Note: You can find this picture of Southern Pacific’s, G-50-25 gondola in Tony Thompson’s book series: Southern Pacific Freight Cars, Volume 1. This is about as close to the prototype as this Tyco car is going to be. For more information about gondolas or other types of freight cars, I would suggest getting Tony’s book series from Signature Press. 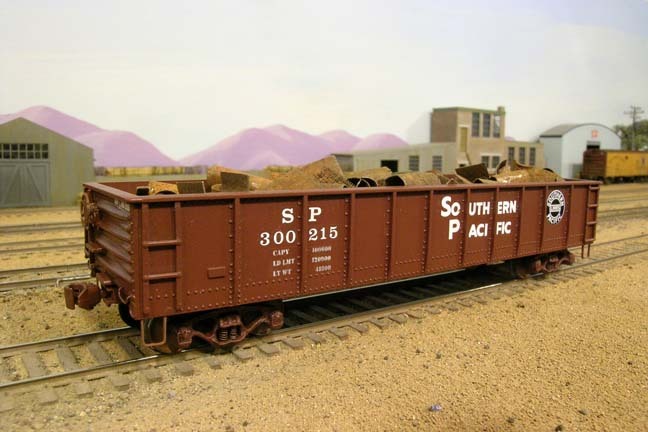 Tony is the ‘SP Historical & Technical Society’s, mister-know-it-all about freight cars.